President Robert Mugabe’s grip on power has faced little recent threat from Zimbabwe’s splintered opposition, but efforts to forge a unified alliance in next year’s election could test his supremacy. Any opposition bloc would first have to overcome fierce rivalries within their various camps, and then hold together in an intense and often violent political landscape dominated by Mugabe’s Zanu PF party. Two deals between opposition parties signed this week represent an embryonic attempt to forge an alternative to Mugabe’s rule, which began with independence from Britain in 1980. Now aged 93 and in weak health, Mugabe has struggled to maintain control over Zanu PF. The party has been hit by infighting and public frustration over the country’s economic woes. The strife presents an opportunity to the opposition only if they can unify, according to Alois Masepe, a Harare-based political analyst. “It is a move in the right direction,” he said of steps toward the alliance. Anything less than unity would mean near-inevitable victory for Mugabe. The going is tough, after decades of repression, vote-rigging and Zanu PF violence during campaigning. But another stumbling block is apathy. 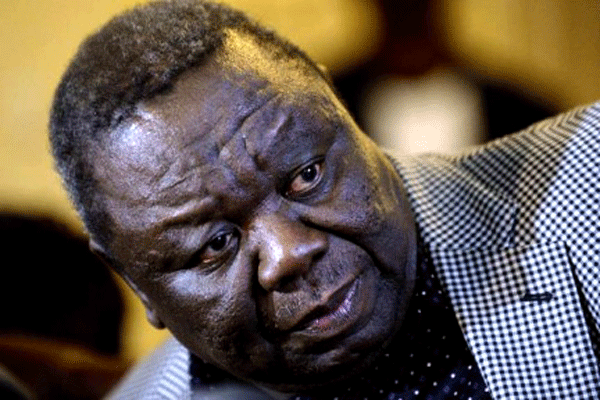 On Wednesday, Morgan Tsvangirai, leader of the Movement for Democratic Change (MDC), held a joint press conference with Mugabe’s former vice president Joice Mujuru, who has set up the National People’s Party. “This is just the beginning,” Tsvangirai said as the two signed a pact to work together to try and topple Mugabe in next year’s poll. The following day, Tsvangirai signed another pact to re-unite with the MDC-N, which split away in 2005, and is led by the influential Welshman Ncube. The MDC has been weakened by repeated splits, and was badly fractured by Tsvangirai’s troubled term as Mugabe’s prime minister in a coalition government from 2009 until 2013. “We owe it to future generations, we owe it to ourselves to do everything that we can to make sure that come 2018 we won’t fail,” Ncube said. In 2008, Tsvangirai pulled out of a run-off against Mugabe after a wave of deadly violence, vote-rigging and voter intimidation from ZANU PF operatives. This week’s pacts, however, are fledgling. “More still needs to be done to unravel the matrix of cheating by ZANU PF,” warned Takavafira Zhou, a political scientist at Masvingo State University. Another tricky problem facing any broad-based opposition alliance would be deciding which of its leaders would emerge as the candidate to take on Mugabe. The two top names would appear to be Tsvangirai and Mujuru, who was expelled from ZANU PF in 2015 after Mugabe’s wife, Grace, accused her of plotting against the president. Mujuru is seen as relatively moderate, but her long record as a former Mugabe loyalist would raise major concerns among those who have opposed the regime – often at great risk – for years. Mugabe himself has mocked the chances of would be opponents. “They have tried this and that, been together, they split again, they talk of coalitions,” he said earlier this month. Mugabe, who would be 99 if he held power through another full term, has ruled through the country’s drastic economic collapse. Hyperiinflation wiped out savings more than 10 years ago, unemployment is over 90% and economic output has halved since 2000, when many white-owned farms were seized. Strife has resurfaced. Last year street protests shut down major towns as citizens demanded help from worsening hardship. Authorities reacted by beating up protesters, arresting activists and banning marches. Although Mugabe has refused to name a successor, his wife Grace and vice president Emmerson Mnangagwa have been touted as favoured replacements.